USES: This refreshing, light-flavored fruit (think strawberries and watermelon) serves as a flavoring for drinks, ices or sauces. FINDING: In many Mexican and well-stocked general groceries. CHOOSING: Prickly pears that have no blemishes and offer a little give (but are still firm) are usually the best ones. Red-fleshed and green-fleshed (usually called “white”) prickly pears are the most commonly available. They look almost the same on the outside. 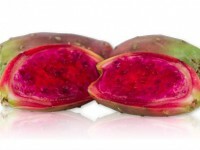 Red prickly pears have a fuller flavor. STORING: In the refrigerator, loosely covered, for up to a month. Prickly pears are typically harvested and sold ripe because they keep well for a long time.